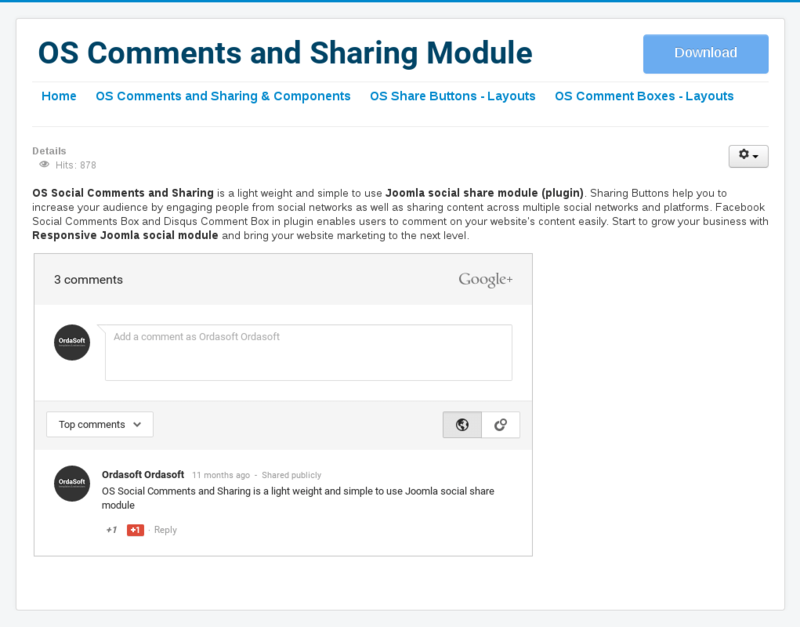 OS Social Comments and Sharing is a light weight and simple to use Joomla social share module (plugin). Sharing Buttons help you to increase your audience by engaging people from social networks as well as sharing content across multiple social networks and platforms. Facebook Social Comments Box and Disqus Comment Box in plugin enables users to comment on your website's content easily. Start to grow your business with Responsive Joomla social module and bring your website marketing to the next level. 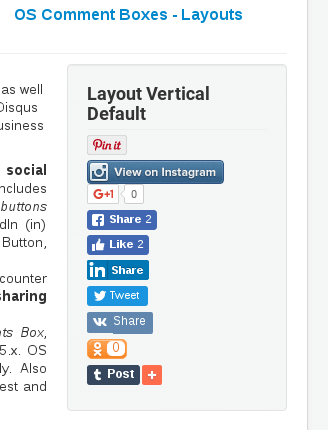 Joomla social share module(plugin) includes 8 awesome layouts and fantastic Joomla social buttons (Round, Square, Tongue), so you can place them anywhere on your website. Plugin also includes preview of layouts in backend. Joomla Social Comments and Sharing has original sharing buttons (Facebook Like button; Facebook share button; Twitter share button; Google+ share button; LinkedIn (in) share button; VKontakte (VK) share button; Odnoklassniki (OK) share button), Instagram Follow Button, Pinterest Follow and Share Buttons, Tumblr Share Button, AddThis. Joomla social sharing module(plugin) also has responsive design, multilanguage options, counter option and settings for changing buttons size. All these features make Social comments and sharing module a powerful tool for integration of your website with social networks. AddThis Social Share is one of the web's leading social tools. Promote your content easily by sharing to over 200 of the most popular social networks (like Pinterest, Google+, WhatsApp, LinkedIn and more). Clean, customizable and simple social buttons are unobtrusive, quick to load and recognized all over the web. AddThis Social Share is everything you need to connect with almost all social networks on Joomla website. We added an ability to select the shape of the button. OS Comments & Sharing module allows you to choose one of the 3 button style: Round, Square, Tongue shape. Accordingly you can use our Joomla Social Comments & Sharing module for any website design. 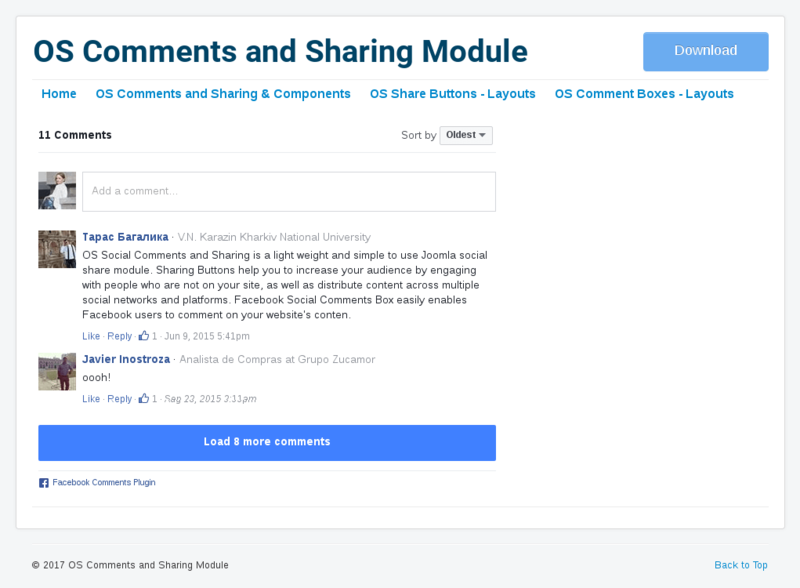 OS Comments and Sharing module allows you to select the desired button size. You can place on your website a few large buttons or many small size buttons. All of this is easily configured in the admin panel. Therefore you will not have problems with the placement of the Joomla Social Share module and it will be suitable for any website. 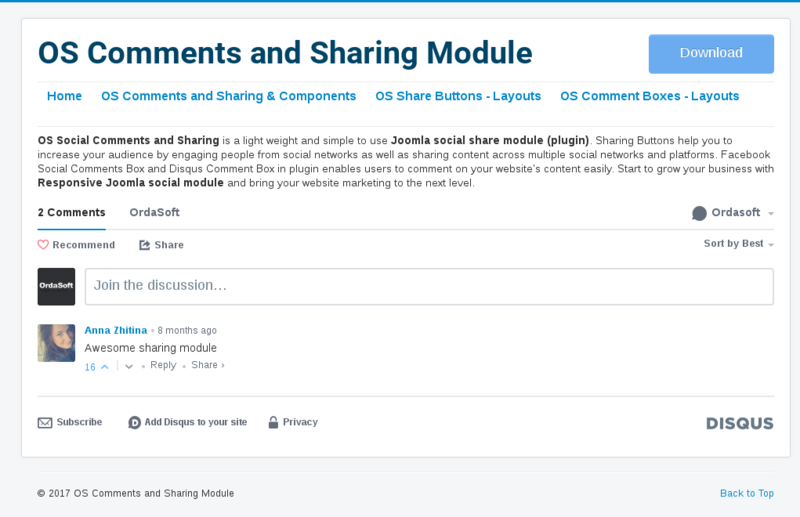 OS Comments and Sharing Joomla module(plugin) includes Facebook Social Comments Box, Google+ Comments Box, VK Comments Box and Disqus Comment tool for discussions, for Joomla 3.7.x. OS Comments Boxes enables Facebook, VK, Disqus, Google+ users comment the site's content easily. Also website visitors can share the comment on their social profiles. Comments can be sorted by top, newest and oldest. Flexible settings for VK (VKontakte) Comments Box and Facebook Comments Box allow to change width of box, number of visible posts and colors scheme of comments box. Facebook Social Comments Box includes moderator settings, moderation of comments can be done using APP ID. Moderate each comment as needed. Drag and Drop feature of Joomla social plugin helps you to drag social buttons in admin area into the order you like, then just click the save icon and your items will be reordered. No coding skills needed, just intuitive creation of interface with drag and drop capabilities. Organize social buttons easily with OS Social Comments and Sharing. Facebook Application ID helps to ensure that the correct product image, product name, and product description continue will be shared in the event of some feature changes. Take your Joomla website marketing to the next level with Facebook Application ID. When you provide this developers option, this Facebook module enables you administer Facebook Pages for products (where you can share product updates and engage with customers who have "Liked" a product). 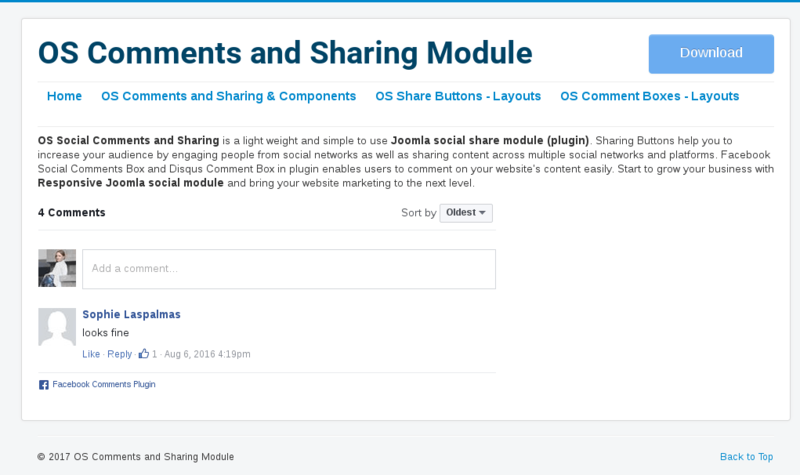 Choose OS Joomla social share and comment module and start making your website social. OS Comments and Sharing is integrated with Google Analytic tool. Your analytic dashboard will base on the actual clicks using the social sharing buttons. A summary of your most shared content is added to the dashboard, as well as the numbers and networks of the last days. Be more social with OS Joomla social share module (plugin), check Sharing Statistics and how popular your content among visitors of Joomla website. XPath is a powerful developer tool for sharing your content. XPath uses path social plugin expression to select nodes or node-sets in an XML document. The node is selected by following a path or steps. You will be able share with any image from your website with your friends. Make your content an immediate hit by sharing it with OS Social share extension. 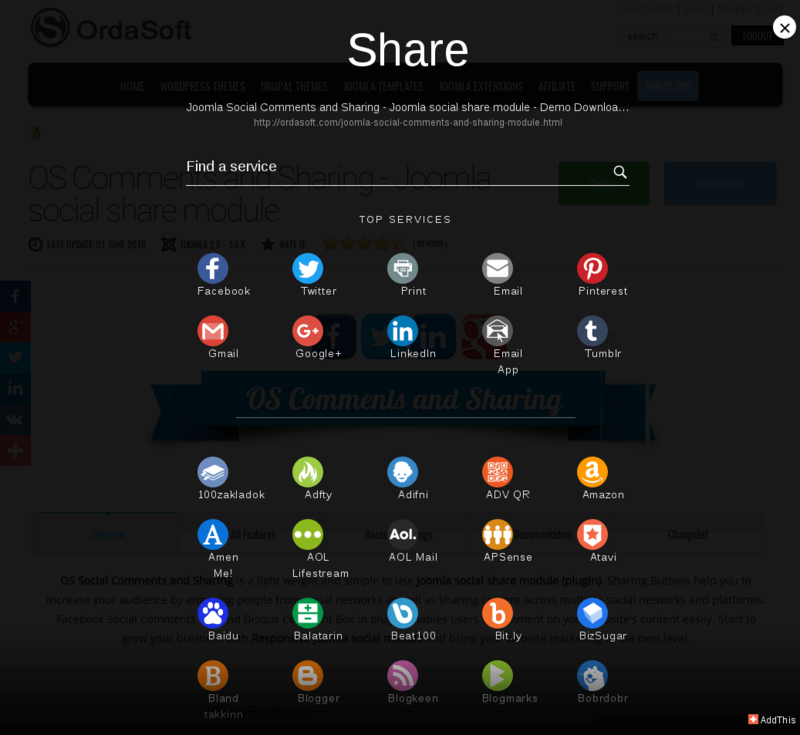 OS Comments and Sharing - Joomla Social Share Module. "Very good, I had no problems with the functioning of this extension. Ordasoft has one of the best supports around. I have purchased many different Joomla extensions and plugins, and their support is top notch! They have extensive demos with descriptions and documentation included." "Functionality is great, full of features. I need to say that support is awesome, had some problems with my site(mainly it was a script clash) but they fixed it. Great support." 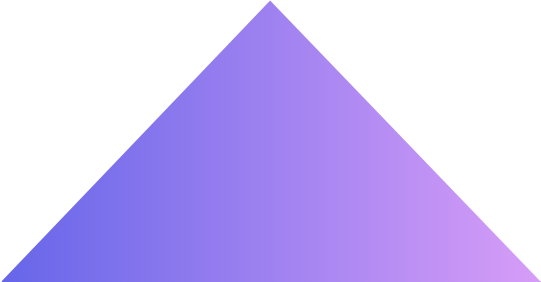 "An module for social sharing your pages. Excellent support. Available on website and e-mail support is excellent." 1. 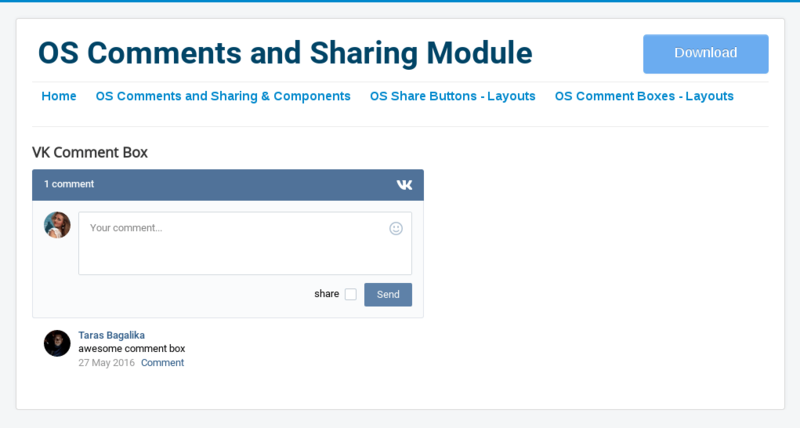 How To Install OS Comments and Sharing - Joomla social share module? 2. How to manage OS Comments and Sharing - Joomla social share plugin? 01. Fixed Facebook module sharing. Now image is pulled out from the first sharing (with help of Xpath option). Get Started with Comments and Sharing Joomla module Today!